Summer, Greece, islands and one day island hopping - a common scenario of people`s vacation. For visitors of Kos, Rhodes and other nearby places, that one-day destination is usually the island of Nisyros. The plan involves visiting an agency, selecting a trip date and later following the preselected schedule of the organizers. The usual one-day plan is made of morning arrival, 2 hour visit of the volcano and idling for the rest of the time in Mandraki, the island`s biggest village and main port. By following this schedule you are guaranteed to miss a lot of what this small island can offer you. So lets see how to get the most of that one day island trip. The most important thing is to make a plan and organize a few things in advance. The first is to buy ferry or travel boat tickets to Nisyros and back. The second thing is to organize transport - due to high vehicle transportation cost it is best to hire a ride at Mandraki, where boats and ferries stop. A bike or car gives you the freedom to go to places on your own and to do things at own discretion and timing, something essential for a great experience. Not being constrained by travel schedule or delayed by a slow group member is a nice benefit, too. 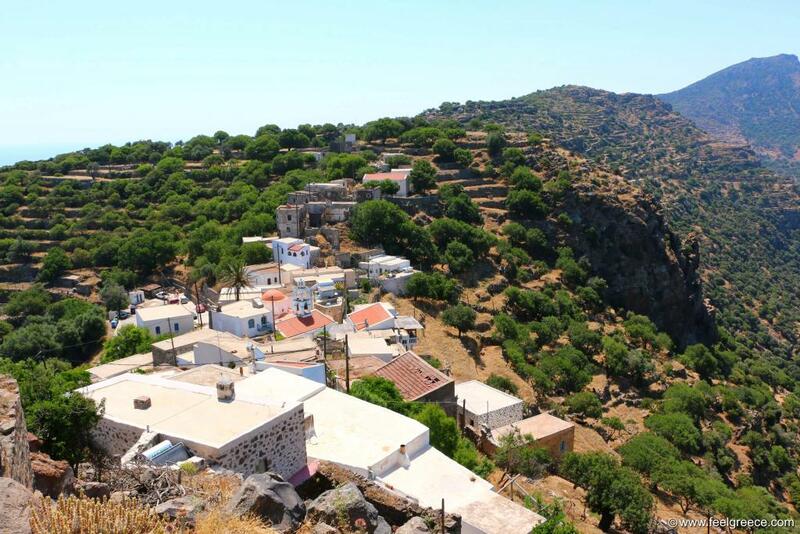 The village of Nikia is a great place to start the island tour - high on the hills and overlooking the Stefanos crater. 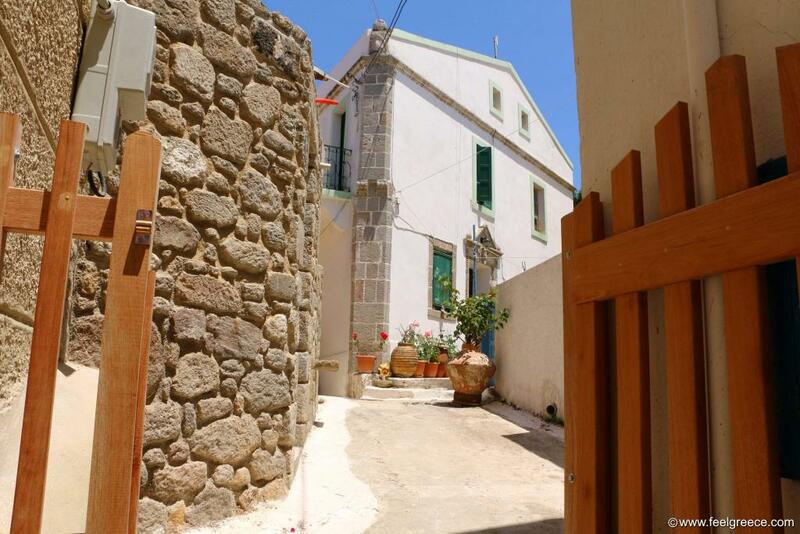 The village is built in traditional style with white washed house and colorful doors and windows. It is best to leave the car at the entrance of the village, where there is a big parking lot and a museum. It is a pleasure to explore the streets and see what lies behind each corner. 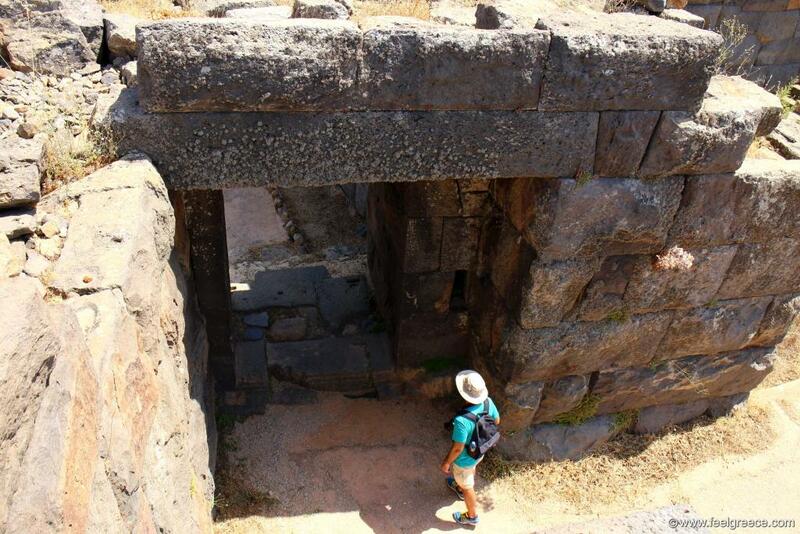 In the center of Nikia there is round square covered with mosaics made of white and gray volcanic stones. The small old church above the square is a must visit place for everyone - it also shows mini exhibition of different religious items and historic artifacts. At the square there is also small cafeteria and traditional taverna, both picturesque and worth a visit, or at least a selfie. The big observation terrace behind the church offers splendid views of the volcano and many of its craters. Most probably you will also see swarms of tourists walking in the volcanic pit, climbing up and down in the crater under the burning sun. The village of Emporios is located next to the road junction for the crater, which makes it suitable for visit right before or after descend to the volcanic pit. It is built along a ridge and definitely worths a visit. Part of the houses are in semi ruins state with only walls standing up, making for the surreal atmosphere of the past lurking behind empty window frames and carved stones speaking tales of old times. As you navigate around the cobbled pathways, you have much to discover - the church, the renovated buildings turned into luxurious villas and the tavernas in the center. The tavernas at the village square are famous for their good meals and terraces overlooking the volcano and the road that snakes to it. Another interesting thing about Emporios is its cave with natural sauna effect, due to the heat emitted from the hot lava deep under the island. 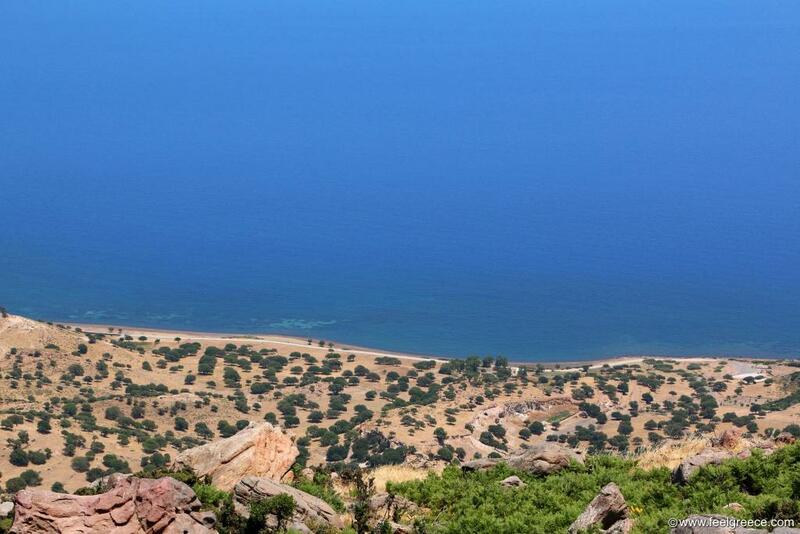 On the east side of the island spread the two beaches of Lyes and Pachia Ammos. Both covered with gray to black sand made of crashed volcanic rock. Out of the top season there are few to none people on these beaches and it is a great place to get away from the noise and relax. Basking under the sun on deserted black sand beach, on an active volcano, is something a few have done. 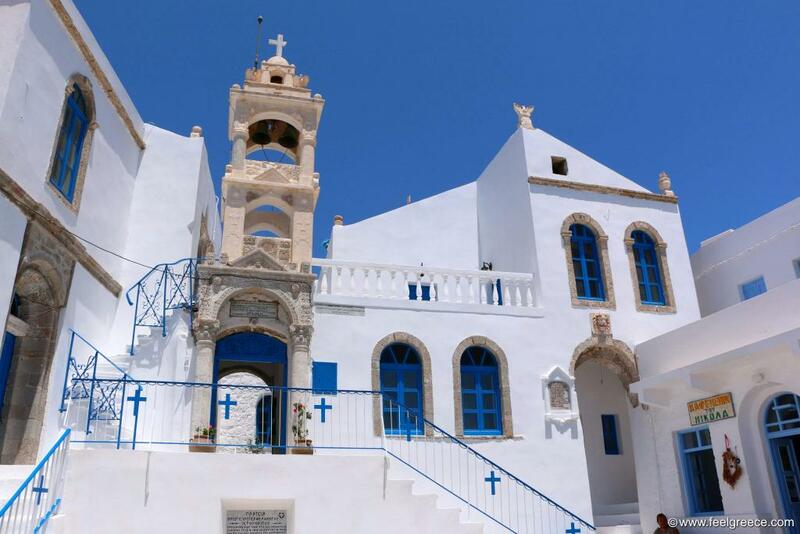 Although small Nisyros is dotted with churches and small chapels all of which has something to show, as many of them allow you to see the volcano from a different point of view. The churches of Panagia Diavatiani and Prophitis Ilias are located on the highest spot of the island, overlooking the crater and the Lakki plain. To get there it is required to walk on foot for a while but the views justify the effort. The monastery of Timios Stavros (The Holy Cross) is another religious sight sitting on the volcano edge - it is opposite Emporios and has views to the craters, the island and the sea. In the yard there are many tables and benches used during the celebrations. And finally, the two churches rising up above Nikia - another Prophitis Ilias and Agios Ioannis Theologos - provide fantastic panoramas you will never forget. The Monastery of Panagia Spiliani on a hill above Mandraki is away from the volcano but it is the oldest on the island, dating back to 14th century and incorporating elements from even older buildings. The monastery is surrounded by а fortress built by the Knights of St. John and the cave inside it hosts a miraculous icon of Virgin Mary. There are also other churches, chapels and one more monastery scattered around the island. Paleocastro is an ancient fortress on the slopes above Mandraki. The fortress walls are built out of gigantic slabs carved out of dark volcanic rock, as if giants had constructed them. Due to the extraordinary size of the stones, the walls are known as Cyclopean walls. The acropolis is restored and well maintained. There are nice walking paths with multiple information panels full of interesting facts, history and diagrams translated in multiple languages. Stairways lead to the top of the solid walls from where splended views are revealed toward the island slopes, Mandraki village and the sea. Despite this, Paleokastro is probably one of the most overlooked sight on the island. Most of the tourists spent half day wandering around in Mandraki and very few know there is such an interesting thing nearby. 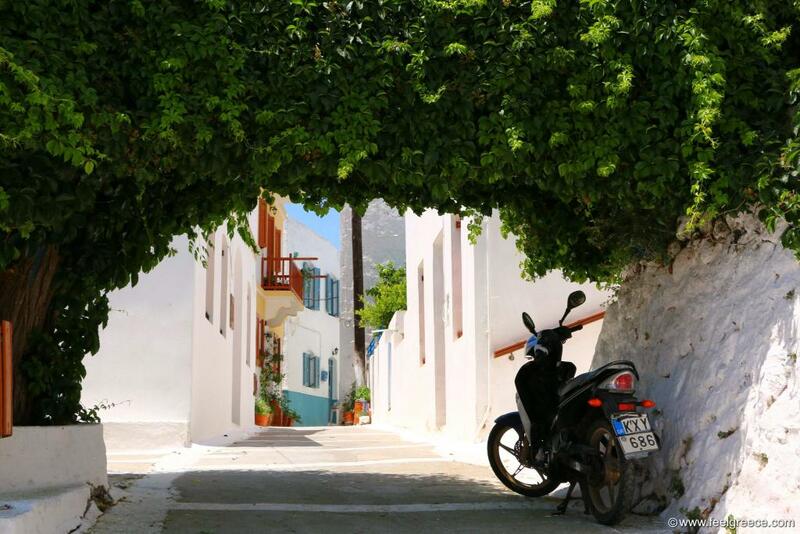 So, if you happen to visit Nisyros for a day, think outside of the box. Although the island is very small it has plenty of sights to be seen, places to be visited and things to be done.